TL;DR: It's great! You should probably play it if you can! How Santorini made its way into my collection is kind of an interesting story, except that it’s not interesting and barely counts as a story. I’d been eyeing it up on various online retailers for several months, watching the price erratically fluctuate from ‘too expensive’ to ‘way too damn expensive’ and back again. I’m not a Kickstarter guy (at least, not for board games) and as such I just assumed that the voracious secondary market was baring its teeth in the usual way – that in order to get the game it would be necessary to kill and skin someone that already owned it. I’d resigned myself to only playing it when the currents of fate occasionally washed it towards my lonely shores as they did during the UK Games Expo. Then I wandered into one of my Friendly Local Game Stores largely on a whim because Mrs Meeple and I had time to kill before the Wonder Woman showing we’d booked. Side note – Wonder Woman was awesome. And lo and behold, not only did they have Santorini at a reasonable retail price, they had three copies sitting there on an otherwise unassuming shelf. I guess the moral of the story is ‘check out your local games stores – availability in this industry is unpredictable and subject to geographical eccentricity’. Look, I warned you in advance it wasn’t an interesting story. I think the blame here is easily fifty-fifty because you had the option to walk away. Let’s get the obvious point dealt with first. Santorini is gorgeous in every way, shape and form. The art is intensely charming and the game pieces almost embarrassingly indulgent. The three dimensional board you construct over the course of play is beautiful enough to be an ornamental centrepiece in a fancy drawing room. Like the actual island of Santorini, it’s a genuine treat for the eyes. The third dimension is one not often especially well exploited in board games and Santorini has made it core to the experience. It’s bloody lovely. Coupled to this is a game that is equally beautiful in its elegance. The back of the box says it takes thirty seconds to learn and you can play it for life. That veers dangerously close to the tedious cliché of ‘a minute to learn, a lifetime to master’ but I’m going to begrudgingly let it off with that because it strikes me as absolutely, unquestionably true. This is a game where all its depth is bound up in what you want to do rather than how you do it. To my mind, that’s always the sign of a tight design – when the rules fade into the background and I don’t even have to think about them. Santorini is complex but utterly straightforward. Is everybody in? The ceremony is about to begin. 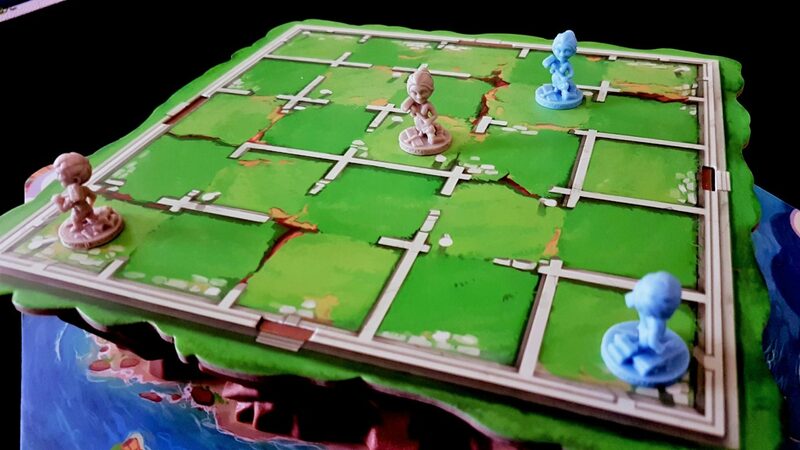 In turn order, players place their two workers on top of the raised island board. Yes – the board is raised. This really is a gorgeous game. This five by five grid represents the constraints of play. While it looks like there are gridlines that channel movement they are decorative only. On their turn, players select one of their workers and move it somewhere in the eight cell neighbourhood. They then build on a square adjacent to their current location with the worker they just moved. Players can built to any height from the ground, but workers can only ever move up a single level at once during a turn. Workers can leap down from any height of building, but the journey upwards is far more demanding. Even the Gods themselves must contend with the intense clinginess of gravity. Each player is attempting to win by maneuvering one of their workers to the top of a building three blocks tall. The movement rules though mean that it’s necessary to build a kind of staircase to the top that must be rigorously constructed and vigilantly defended. You’ve got two workers available to you during each turn, and you’ll be using them constantly as sword and shield. One will be striking forward to open up new territories while the other nervously hops between your constructed buildings trying to prevent sabotage. Unfortunately, each turn you pick one worker or the other – you play offensively or defensively, but you can’t play both roles at the same time unless you get very lucky and a single action accomplishes both goals. Mostly though your plans are so tightly coupled to the spatiality of the board that such opportunities arise rarely, if ever. Your workers are constantly in motion, and your building plans have to be robust enough to incorporate distance into their defensibility. There’s little worse than seeing your opponent sneaking up to a building you were saving for your own uses only to realise you’re too far away to stop them making it their own. There’s something here we haven’t raised yet, you see – you can build all of the structures in the game up to the third floor. Any of them will be fine for securing you the win. But there are four parts to each building – the fourth floor adds a blue dome that caps it off and renders it unusable by anyone. Anyone can do this from an adjacent square, and bear in mind this is a five by five board. Getting up to the third floor of a building would be utterly trivial if it wasn’t for the fact someone else is simultaneously trying to stop you doing that while trying to get there themselves. The end point of this is like a tabletop version of Mount Your Friends except with a more family friendly aesthetic and fewer jiggling jockstraps. 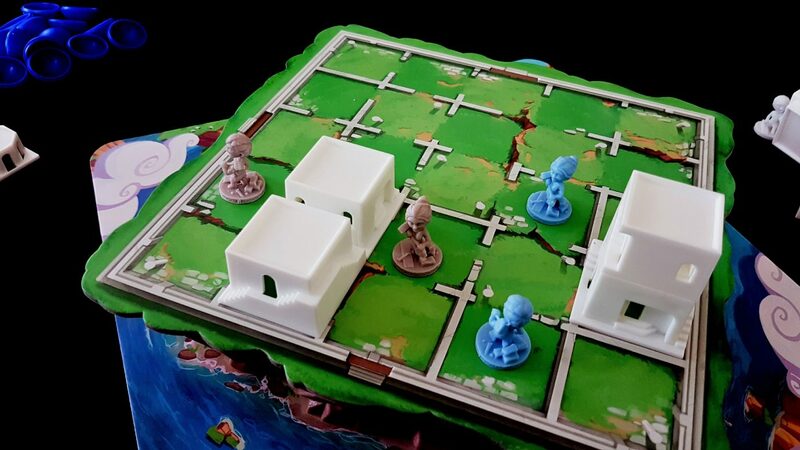 The core game is superbly strategic – you get nowhere by going head to head with an opponent. You can mirror each other and prevent any tiny advantage if you play within too close quarters and nobody gets anything done if they’re doing that. Instead, what you need to do is create traps – as in a game of chess, you need to box in enemy pieces, set up pins, and ruthlessly exploit forks. You don’t pick a tower and head for it – you meander around, directing attention elsewhere as you slowly build up an environment that lets you reach a building that someone else just can’t get to in time. You want to make the path you create to the top look like the natural by-product of some other devious machination. You want your opponent to realise the truth after it’s too late for them to do anything about it. It makes you feel very clever when you accomplish this but bear in mind you’re going head to head with someone equally invested in obfuscation of intention. The resources you laid for your benefit might end up serving your opponent just as well. Often you place the penultimate piece in a master plan to realise, one turn too late, that you just won the game for your opponent. Santorini is tight and pleasingly cerebral. Were this all that was to be found in the game of Santori, it would still be good – a solid abstract with real table presence (urgh). The base, core game is as deep as a grave and I think you could invest many happy hours into mastering the tactical and strategic puzzles of placement and positioning. 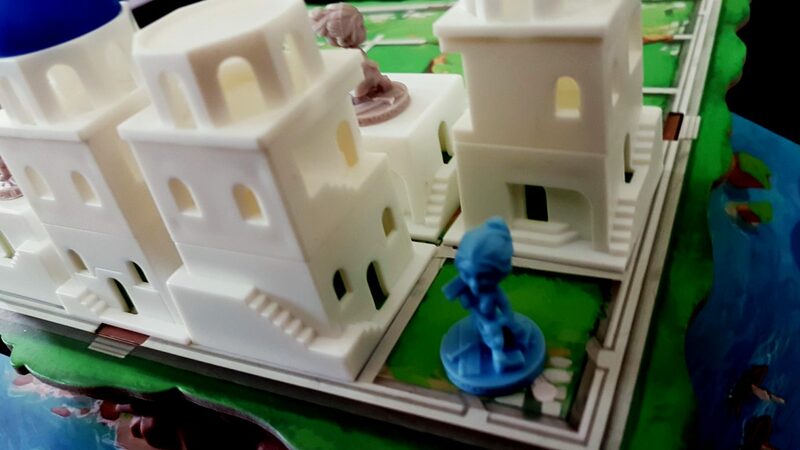 But it’s at this point, when you’re comfortable with the ruleset, that Santorini explodes in a shower of generosity that takes a fixed possibility space and starts weaving it into an infinite tapestry of variability. For those that haven’t encountered the term ‘possibility space’, it’s a way of referring to all of the possible valid states that exist in a system. Games like chess and Go are marked by the complexity of their possibility space. Games like connect four or noughts and crosses are equally marked by the simplicity of theirs. The more complex a possibility space, the deeper choices a game tends to offer. The real mark of depth though is how interesting any single point in that possibility space can be. 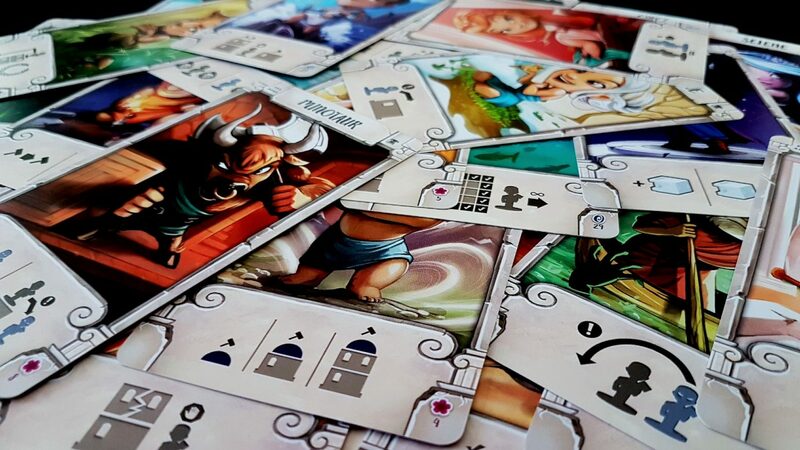 Santorini’s possibility space is intensely enriched by the presence of special God cards that basically ensure that any game has its own unique textures and nuances. With these, individual squares on the board have a value that ebbs and flows with both the gods and the history of the session. Asymmetrical powers always have this kind of impact in a game but when layered onto the ephemeral framework of Santorini they have a disproportionately heavy impact on how the game works. In most games, asymmetrical powers find themselves situated within a gaming architecture that is otherwise completely fixed. They add to the possibility space but they don’t comprehensively reshape it because most of the system is rigidly unaffected and usually designed in such a way as to flex and bow with player powers. Santorini on the other hand really only has a handful of rules, and changing any one of these makes it a very different game. It still feels and plays the same, but the decisions you need to make become entirely coupled to the specific setup of the match. The god cards don’t simply alter the efficiency of a fixed strategy – they create and reinvent and reinterpret strategies and force you to adapt on the fly. Powers that dominate in a game against one God can become a liability in a game with another, and you’ll only know that through experience and careful consideration of the board. You might be Hermes, and your workers can move any numbers of spaces provided it’s on a level plane. You might be Poseidon, in which case an unmoved worker on the ground gets to build three times. If you’re Morpheus, you don’t have to build at all – you can accumulate individual blocks over several turns and then place them all in one single action. Aphrodite forces your opponent’s pieces that begin adjacent to one of her workers to end their move adjacent. In a game with only three rules, every one of these gods has an effect on the game that distorts everything on the board. As you might imagine, these cards introduce some serious balance issues and create occasionally deeply unfair juxtapositions. 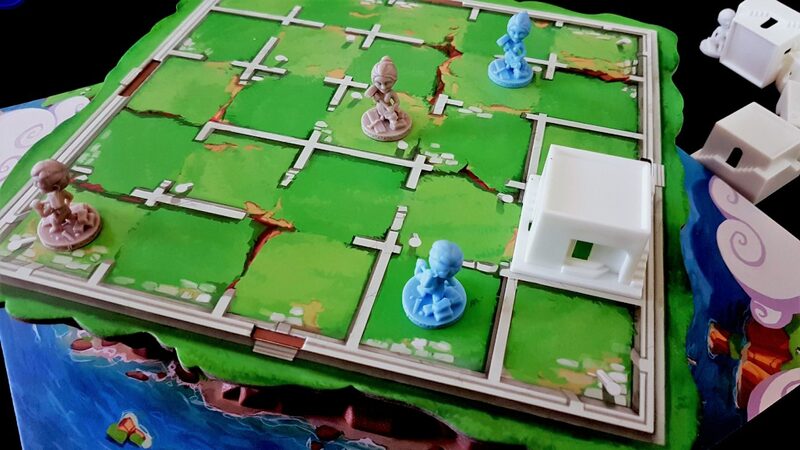 They also pretty much guarantee that the meta-game of Santorini is fundamentally unknowable – developing a winning strategy that works in all cases is all but impossible. That’s fascinating but it’s even more interesting than just that. Some of the Gods don’t give you new powers – instead, they give you and you alone new win conditions! The God Pan adds a win condition that triggers if any of your workers jump down two or more levels. So not only does your opponent need to stop you getting too high, they need to stop you jumping too low. Yikes! The Eros player must place workers on opposite sides of the board at setup, and wins if they move adjacent to each other on a first floor building. Yikes again. Chronus wins the game if there are five completed towers on the board. Yikes, yoinks, and gadzooks. Some powers give you more options, some give you more tools for winning, others work to restrict the options of your opponents. All of them add new wrinkles and textures to a landscape of play that was perfectly interesting without them. You even get to decide whether or not you use them. 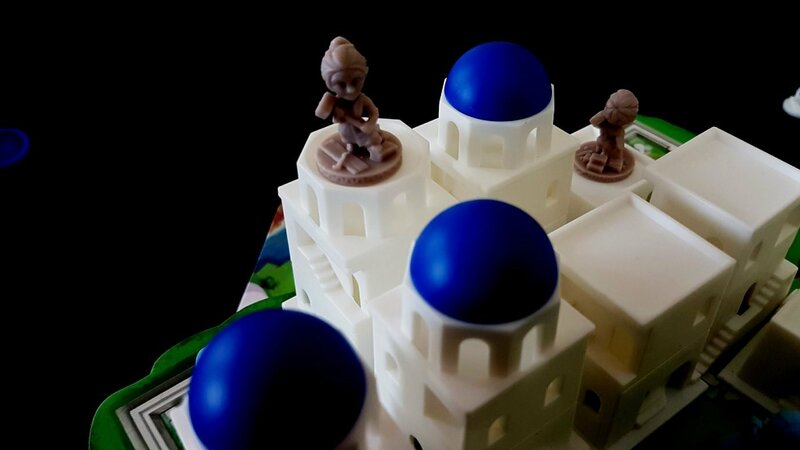 You can play Santorini as a cold, dispassionate abstract game without variation or surprises. You can also play it as a specific flavour of Gods picked by collegiate selection. Or you can do what Mrs Meeple and I do which is to shuffle the God cards and play with whatever we get. Whether you enjoy the unpredictability of improvisation or the mastery of a specific puzzle, Santorini has your back. This is a game that absolutely can sustain your interest over the long term if you want to make the investment of your attention. That in the end is its best strength and most significant weakness. 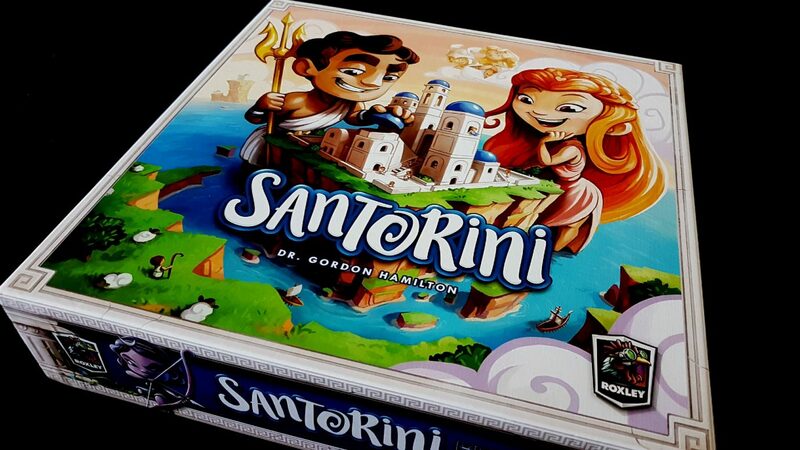 You can get a lot out of Santorini by dipping your toe in occasionally – in an hour’s gaming you could play it four or five times if you’re lucky, and you’ll likely enjoy it each time. Games where the task is to master a possibility space don’t particularly thrive though when being sampled occasionally. The canonical example of Chess is particularly relevant here – it’s hard to justify the time needed to really get the most out of this game in a society where literacy in the game systems is a vanishingly rare commodity. You can find honest challenges in Chess without a lot of effort – there’s probably a chess club somewhere near you. There are, I suspect, vanishingly few Santorini clubs in the world other than the one you can set up in your own home with your own friends. Santorini is fun even for novices, but to keep getting the most out of it you’ll need an equally committed antagonist just as interested as you in squeezing the juice from the experience. You’ll need an Athena to your Ares, or a Cronus to your Zeus. Santorini works especially well when the players are roughly equally matched. Random setups help with this, but if you want to get good at this game you’ll need to spend a lot of time teasing out its intricacies and that might be a tall order. But please, don’t let that put you off. 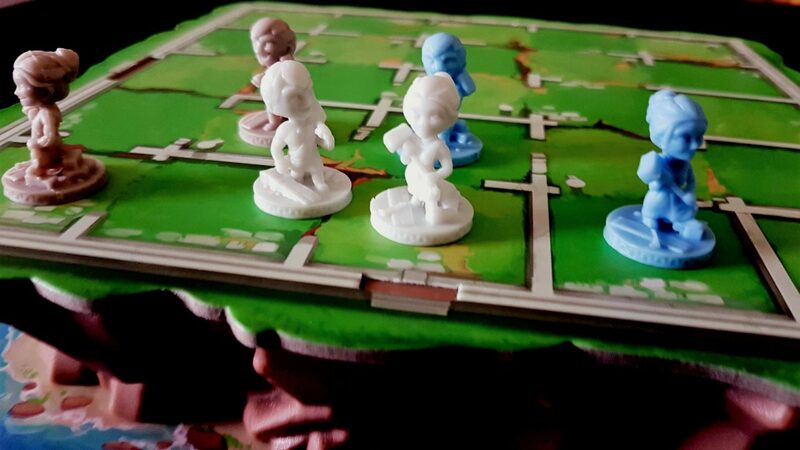 In our Hive review we discussed how the game failed for us because it simply wasn’t possible to get anyone to play it a second time. We said that it’s almost certainly as deep and fun a game as people claim, but that’s hard to say for sure when considering the difficulty of finding opponents of comparable skill and experience. Hive’s problem is that scaffolding that skill level isn’t fun in and of itself. 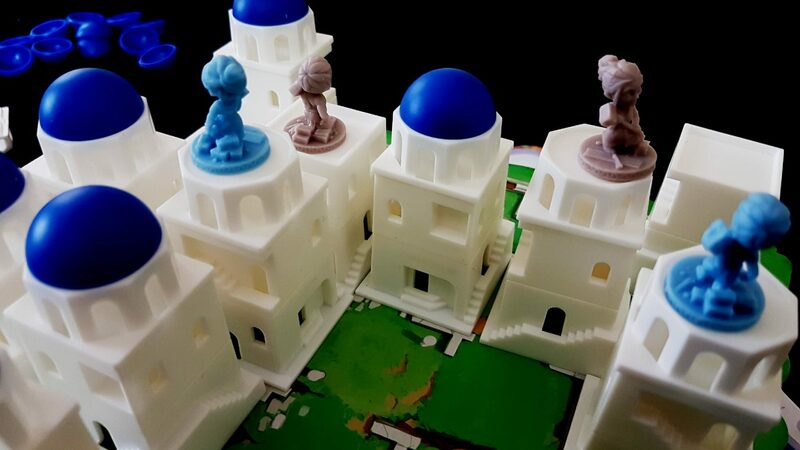 Santorini doesn’t have that issue – it’s so easy to learn that nobody has to struggle to see how the parts fit together. Santorini does though have the same requirement for commitment to enjoy it to the fullest. It’s also a lot of fun though when you just fritter around the edges. Our rating here relates to the enjoyment an occasional dabbler will extract from the experience. I suspect someone with the time to make this a centrepiece of their hobby will find Santorini an even better, richer, and more rewarding game than that.